Yep, I’m at it again! 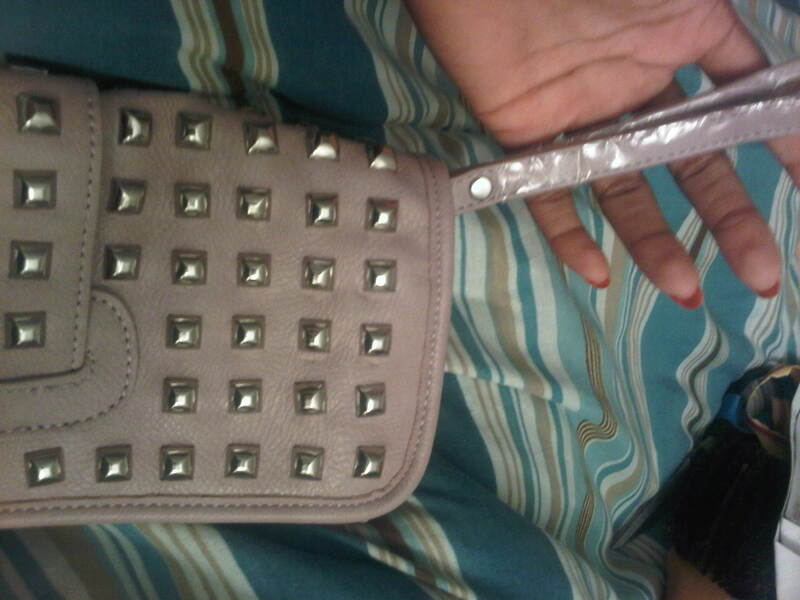 I LOVE purses. Like I’m not even sure that sentence quite expresses my feelings for this kind of accessory. I have a soft spot for them. I don’t think I really know how to say no [if its cute, and its reasonable, it is MINE!! no room for discussion] to them. I was out ‘window-shopping’ with my mom, sister and a few other ladies, when my mom brought one of my recent buys to my attention [See?! Blame her! I wouldn’t even have seen it were it not for her. I’m totally innocent I tell you :)] and I had to catch my breath. I ‘ooed’ and ‘aahhed’ over it. I almost started squealing in the store. Yayness!! I’m so excited guys!! At first I was only going to get one of them, but then I said to myself, “Since these are the only ones left of their kind, its better for me to buy them and then change my mind and return it, than to leave them here, be tormented in my sleep for not buying it, and then come back and not find them”. Logical, right?! I knew you’d agree :). 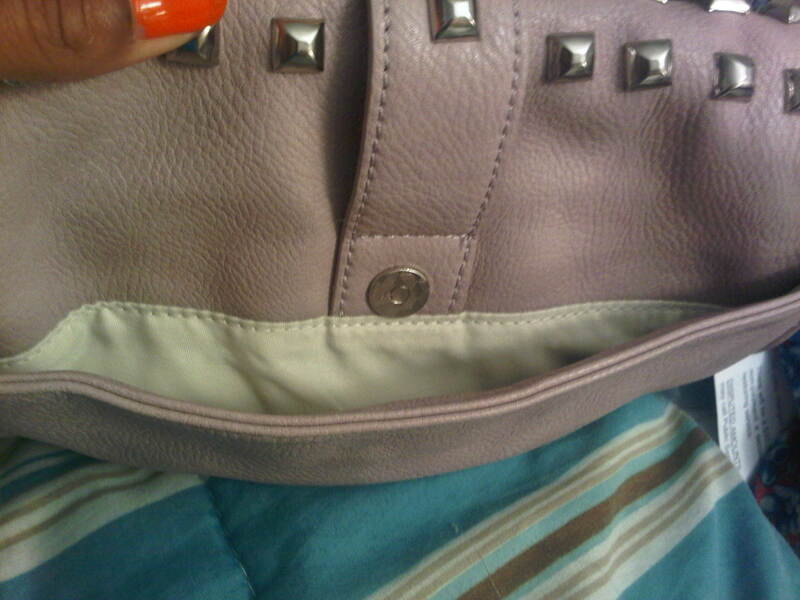 1) The smaller of the two, is a lavender leatherette clutch, with square studs on the front flap. 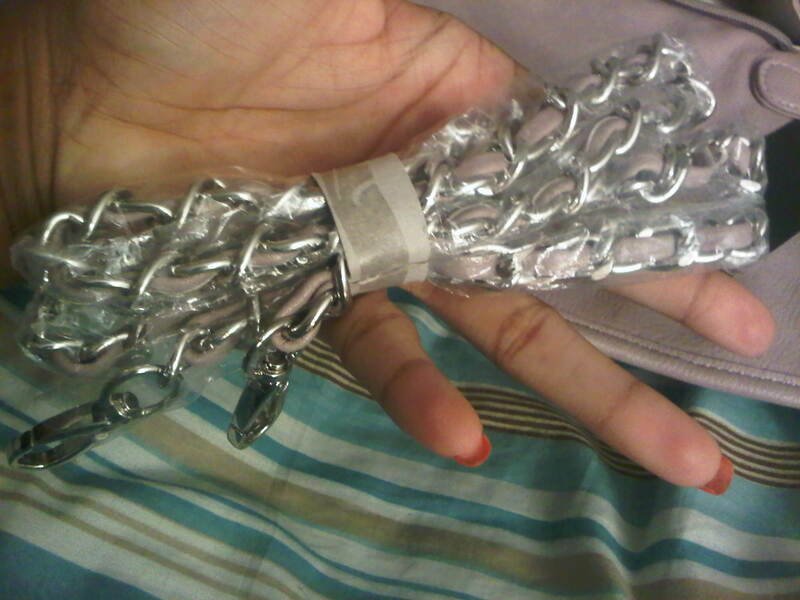 It comes with a wrist strap as well as a shoulder strap that is metal with intertwined leatherette fabric in it. 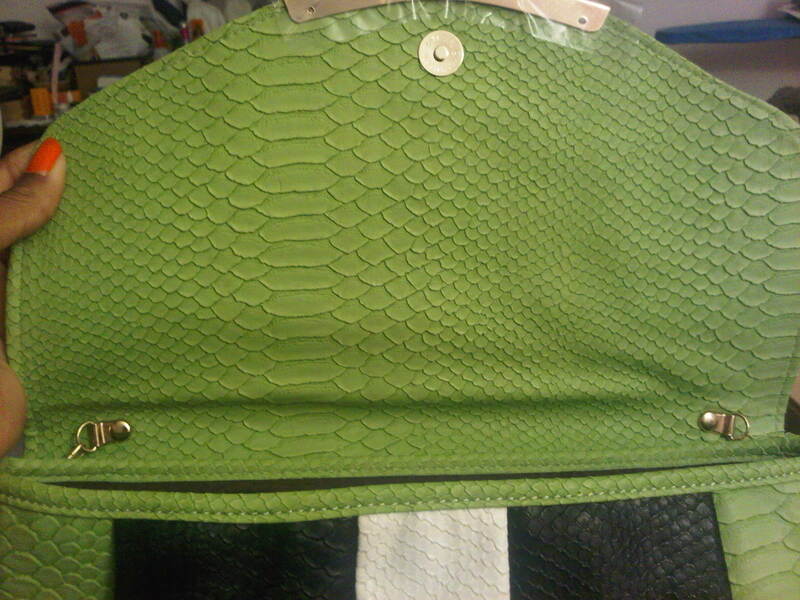 It also has a band going down the center front of the flap, with studs on it for added detail and uniqueness. 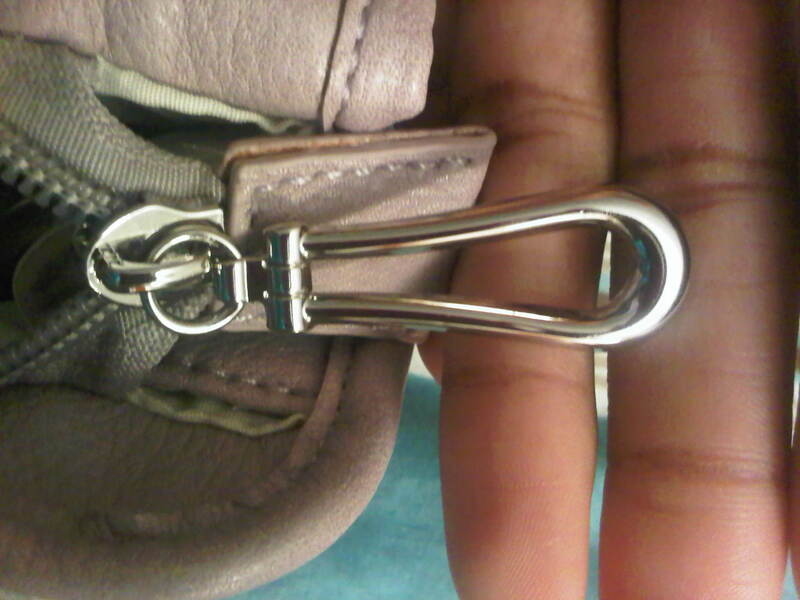 It has a magnetic button closure on the flap, as will as the purse itself has a zipper closure. It is also fully lined with a small inner pocket, as well as an outer lined pocket on the back with a magnetic button closure. 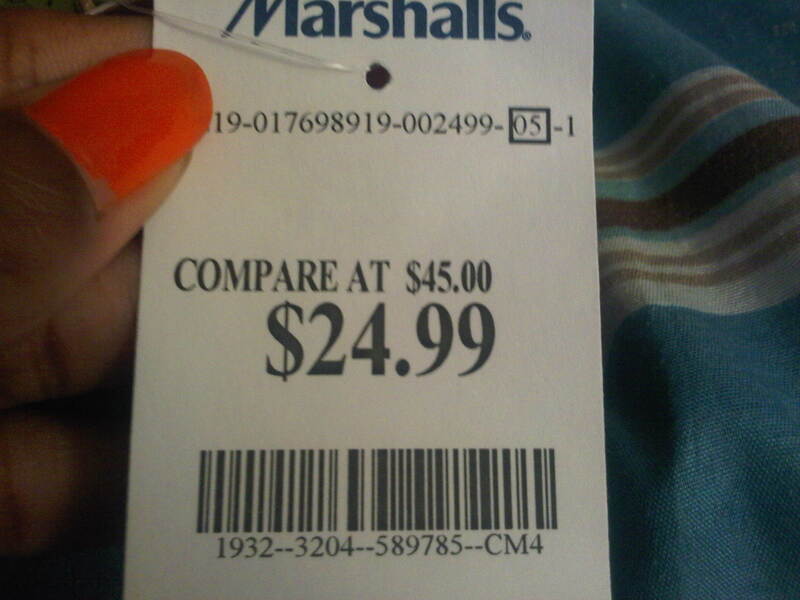 It was $ 19.99 at Marshalls [Originally $ 35.00]. 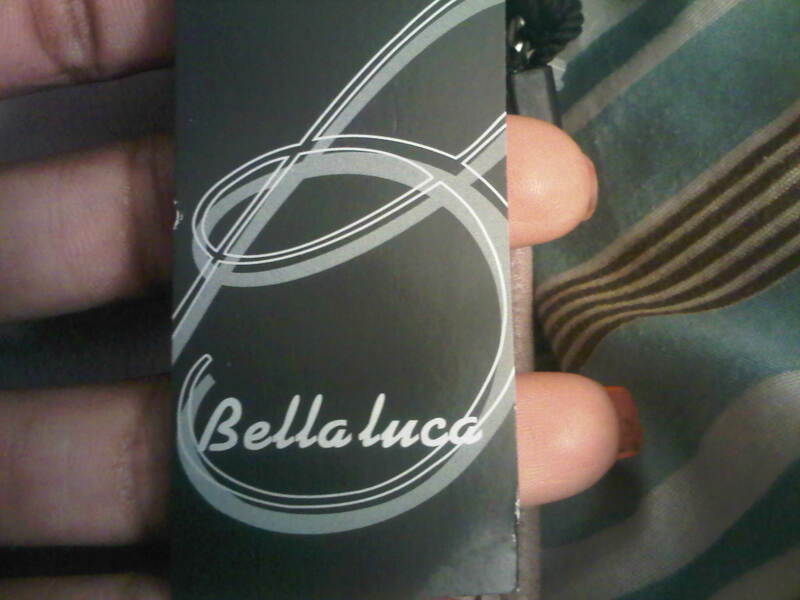 The designer is Bellaluca. 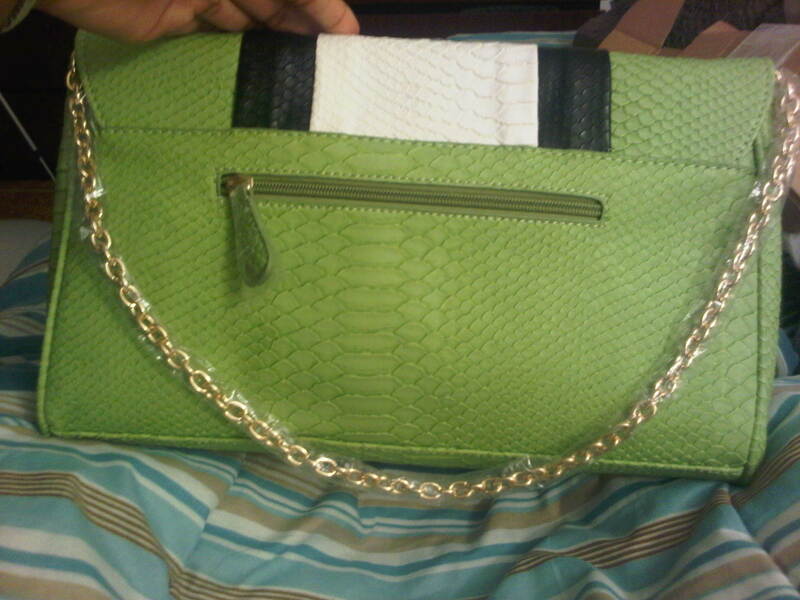 2) The second purse was the one that caused my purchase in the first place. This was the one my mom showed me. 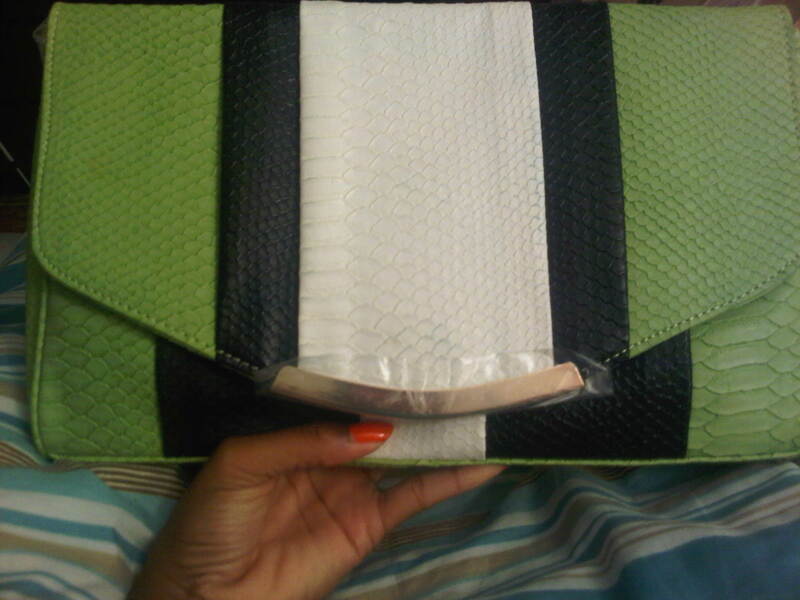 Its a faux snakeskin fabric. 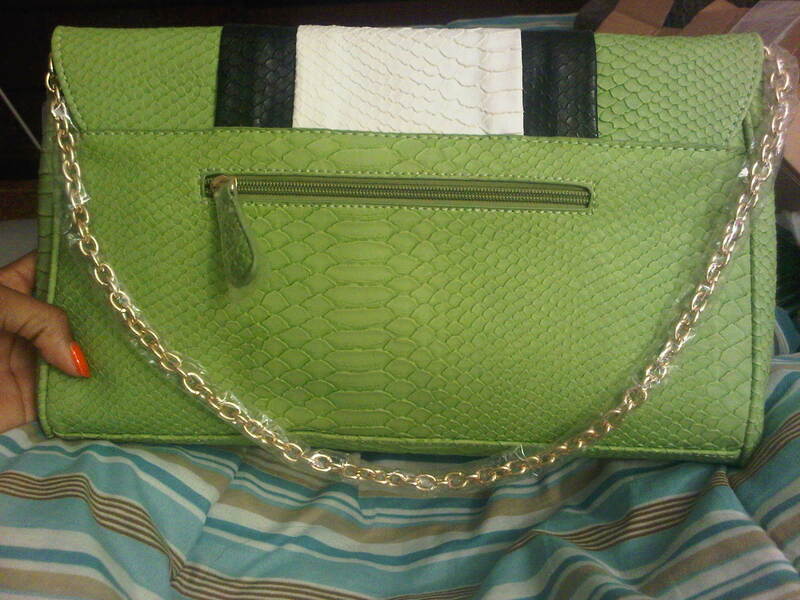 Its color-blocked with lizard green, black and white. It has a centered gold plate on the front flap. 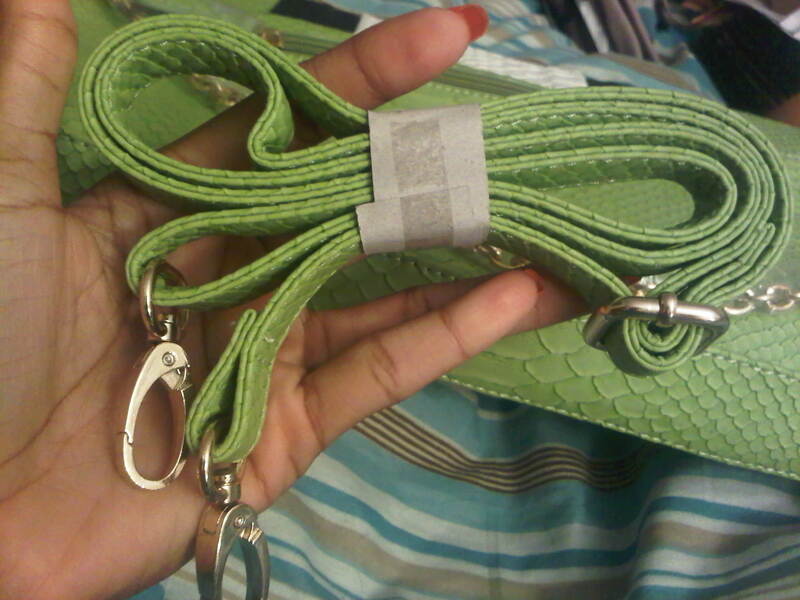 It comes with 2 detachable straps: a gold metal one as well a faux snakeskin green one [which is adjustable in length]. 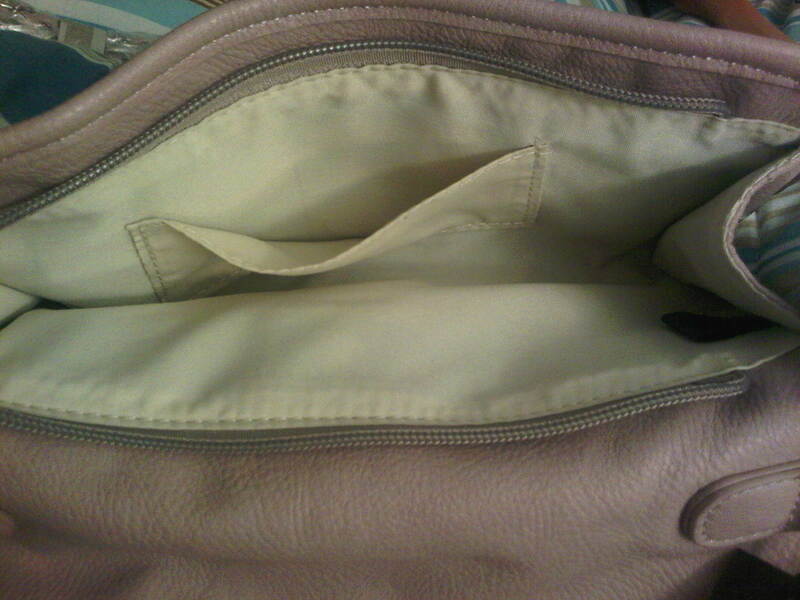 It has a magnetic button closure, an inside zipper pocket, and 2 other inside pockets perfect for small items. 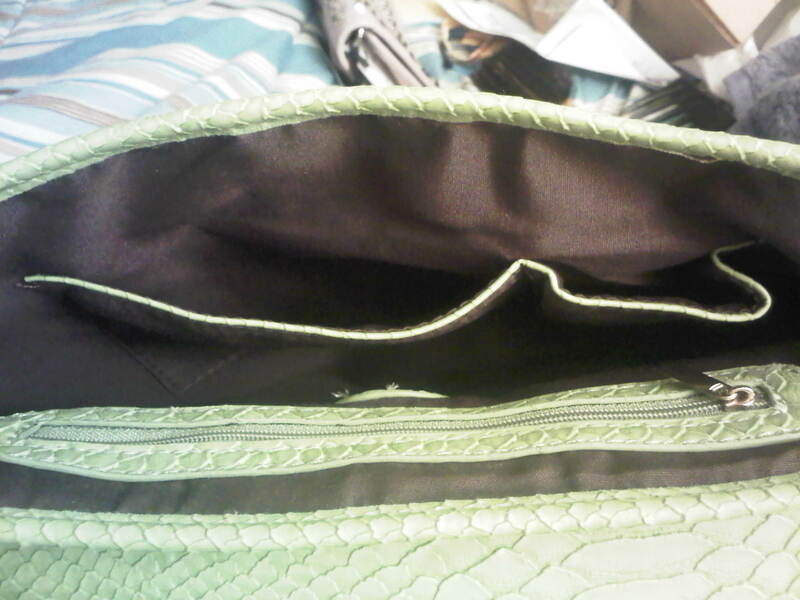 The clutch also has a back zipper compartment. 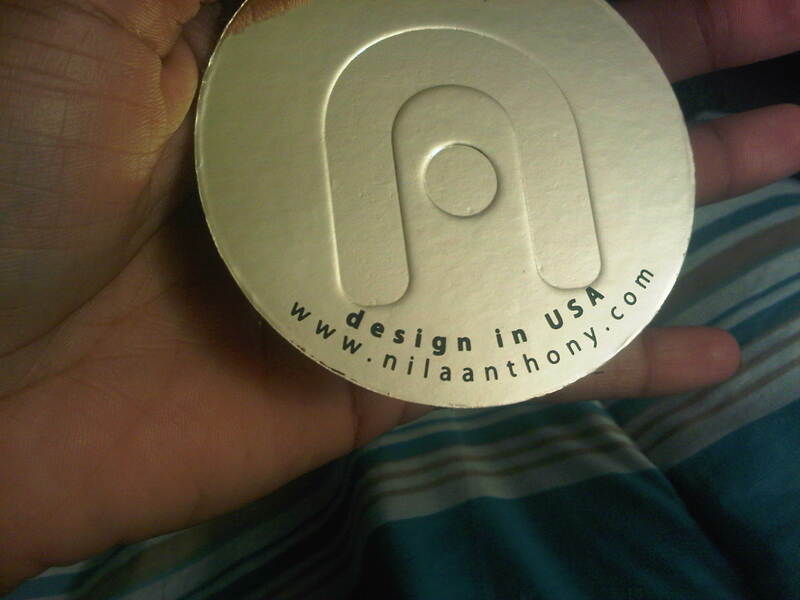 It was $ 24.99 at Marshalls [Originially $ 45.00] and is designed Nila Anthony. I am so pleased with my purchases [and no buyers remorse, I am NOT giving them back!!] Hope you guys enjoy and if you’d like them in your collection, then check out your local Marshalls.